This dramatic Sofreh was created by Square Root Designs for a Persian wedding, which took place at sunset at this beautiful ceremony location. The bride wore a wedding dress by Baracci, which was absolutely stunning and converted into a mini-dress for the reception. The family photos with the Sofreh took place after the traditional Persian ceremony. The heavy marine layer that often hovers at the So Cal coastline means that sunsets are not always visible. On this day, the sunset was peeking out just behind a light marine layer, so we used off-camera lighting to help bring in the color in the sky. 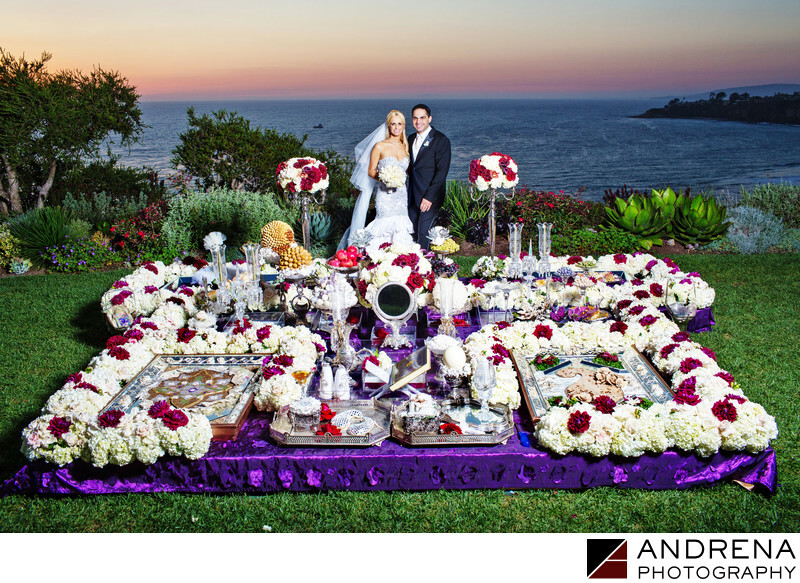 Persian wedding photographed at the Ritz-Carlton, Laguna Niguel.